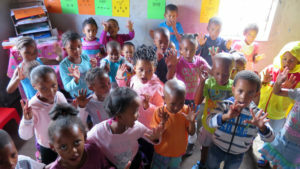 Solar Capital De Aar 3 has joined forces with the Karoo Eisteddfod Trust in a comprehensive holistic programme to alleviate the tremendous need in the Early Childhood Development (ECD) sector of the Emthanjeni Municipality. The first part of the programme assists the crèches involved in assisting centres with obtaining formal registration with the Department of Social Development. Registration will insure a government subsidy and visitations from care workers, specialised ECD developers, and the Department of Social Development. Another part of the programme concentrates on training informal ECD practitioners in the area. 32 local women are currently receiving training on how to stimulate the development of a child through the teaching of the national curriculum. During the 0-3 year period, a child develops his / her ability to think learn, communicate, concentrate and relate to others. Training for teachers aims to implement the national curriculum which enables this hugely important development, while parents are invited to become involved and promote healthy family life.